Flight 63 originated at and left Cleveland about 17:42.The flight was cleared to Memphis with intermediate stops scheduled at Columbus, Dayton, Cincinnati, Louisville and Nashville. 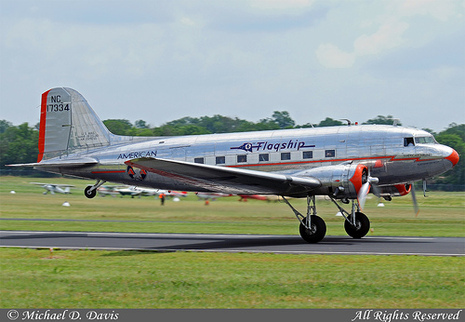 The DC-3, named "Flagship Ohio", arrived at Louisville at 21:42. It was refueled and cleared to take off at 21:54 to fly at 2500 feet to Smiths Grove, Kentucky at 2500 feet and continue to Nashville at 2000 feet with estimated time of arrival at Nashville of 22:54. Near Smiths Grove, in an area with rolling terrain, varying in altitude from 695 to 720 feet above sea level, the plane descended until it contacted trees. The airplane continued through another small clump of trees, then across an open field and stopped in an upright position among several larger trees, about 1000 feet beyond the point of first impact. PROBABLE CAUSE: "Loss of control of the aircraft due to unusually severe turbulence and violent downdraft caused by a thunderstorm of unknown and unpredictable intensity." American Airlines Flight 63, nicknamed the Flagship Ohio, was a Douglas DC-3 routing Cleveland-Columbus-Dayton-Cincinnati-Louisville-Nashville-Memphis that crashed on the next-to-last segment of the flight (Louisville-Nashville) about west of Trammel, Kentucky on July 28, 1943. The plane descended from until it struck trees, then across an open field and stopped in an upright position. Flight 63 departed Cleveland at approximately 5:42 pm on July 28, 1943. The flight proceeded normally during its scheduled stops in Columbus, Dayton, Cincinnati, and Louisville. The aircraft arrived at its fourth stop, Louisville, at 9:42 pm. After refueling, the flight received clearance to depart at 9:54 pm. During the Louisville-Nashville leg, the Flagship Ohio was crewed by four American Airlines personnel, and carried eighteen passengers. The aircraft's departure clearance specified an altitude of 2,500 feet (760 m) to Smiths Grove, Kentucky, and then at 2,000 feet (610 m) onward to Nashville. The projected arrival time was 10:54 pm — an hour's flight.